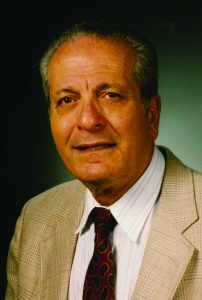 Abdel-Aziz A. Fouad, distinguished professor emeritus of the Department of Electrical and Computer Engineering (ECpE) at Iowa State University, passed away at the age of 89 on Oct. 21, 2017. Aziz was a pioneer in the electrical engineering field of power systems dynamics and stability, most notably in his visionary contributions to academic research, teaching and publication, collaboration between academia, the power industry and early explorations of technology and social change. Aziz was elected to the U.S. National Academy of Engineering (1996), was named an Anson Marston Distinguished Professor (1990), received the Anson Marston Medal from the ISU Alumni Foundation and is a Fellow of the Institute of Electrical and Electronics Engineers (IEEE). Aziz was co-author of two widely-read books, “Power System Control and Stability” and “Power System Transient Stability Analysis Using the Transient Energy Function Method.” Throughout his 35 years teaching at Iowa State he taught multiple classes, including creation of several early computer-based educational courses, and he authored over 100 publications in his field. Aziz also served as a visiting professor at the University of the Philippines, the Federal University of Rio de Janeiro, Brazil, and the Electric Power Research Institute of Palo Alto, California. 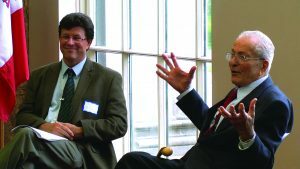 One of his most significant contributions to the industry and academia was the co-founding of Iowa State’s Power Affiliate Research Program in 1963, now known as the Electric Power Research Center. ECpE Professor Jim McCalley said Aziz’s legacy will continue to be remembered at Iowa State for years to come. Jim McCalley and Aziz Fouad in 2014. Aziz was born in Cairo, Egypt, in 1928, received a bachelor’s degree in engineering from the University of Cairo (1950), immigrated to the USA in 1952 and received a master’s degree from the University of Iowa (1953) and a Ph.D. from Iowa State (1956). While at the University of Iowa, Aziz met his wife of 56 years, Maria Elisabeth (Leal) Fouad, who passed away in 2009. Aziz and Elisabeth are survived by their two children, Nadya Fouad and Sam H. Fouad, five grandchildren and two great-grandchildren. Aziz’s daughter Nadya said her father was deeply committed to Iowa State and established a family connection to the university. Contributions in memory of Abdel-Aziz A. Fouad are requested to be directed to the Iowa State University Foundation, in memory of AA Fouad, 2505 University Boulevard, Ames, Iowa 50010. Donations will be directed to the Electrical Power Research Center. In 1973 I was hired as a secretary in the EECpE department but also secretary to the Technology and Social Change in Foreign Cultures Program, an interdisciplinary program under the direction of Dr. Fouad. He was great to work for and a wonderful person. Great memories!!! !